The Museum houses over 173,000 zoological specimens of which more than 50,000 are vertebrates. 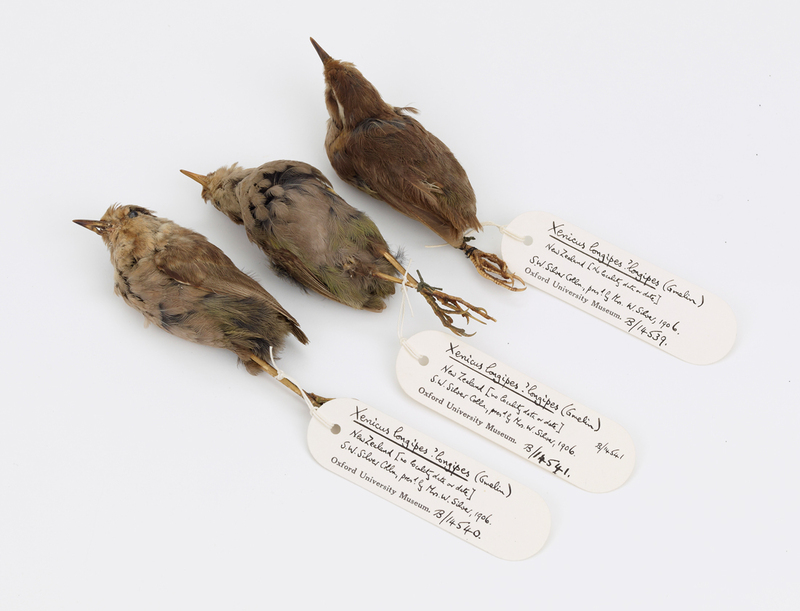 Numerous examples of historically and scientifically important specimens can be found across its range of mammals, birds, fishes, amphibians and reptiles. Preservation methods are varied, ranging from dry skins (flat, stuffed or mounted), osteological material, egg shells and bird pellets to dissections and animals preserved in formalin and industrial methylated spirits. There is also a large repository of plaster casts, wax models and microscope slides housed on site. The bird collection, with over 38,000 specimens, makes up the largest part of the vertebrate collection. It houses a wide array of objects, including bird eggs and nests, skin, bones and fluid-preserved material. Rare examples of extinct birds such as the dodo, passenger pigeon, huia and Carolina parakeet can be found here. It is also home to an egg of the extinct great auk. One of the oldest natural history collections in the world was assembled by the Tradescant family in the early 17th century in South Lambeth. A record of its contents was listed in a catalogue, the first of its kind, and printed in 1656. Some of the surviving rarities of this ‘Musaeum Tradescantianum’ are still housed in the Museum today. One of its highlights is the dodo, with the only surviving soft tissue samples of head and foot in the world. Other founding collections include parts of the Ashmolean Museum and the Christ Church Anatomical Museum, which were donated in 1860 on occasion of the opening of the Natural History Museum. To this day, students and researchers from all over the world visit the museum and make use of its huge collections to further science. Museum staff are also involved in teaching and organising classes for the University of Oxford, Oxford Brookes University and beyond. Many historic figures in natural history are linked to the vertebrate collection. For example, W J Burchell collected specimens from all over the world, of which 32 mammals, 484 birds and 12 turtle specimens are in the Museum. After his death they were donated in 1865 by his sister Miss Anna Burchell. The collection also houses 196 turtles, of which over 60 are type specimens collected by Thomas Bell. Bell’s collection of reptiles was purchased by Revd. Frederick W. Hope and presented to the University in 1862.